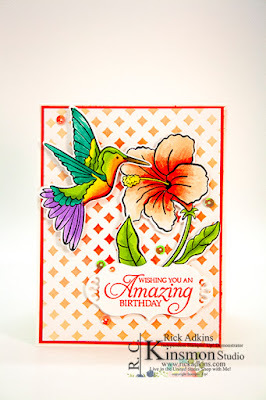 Hello and welcome to my blog; today I am going to share with you my project for this month's Stampers Showcase Blog Hop. The theme for this month's hop is Birthdays, and I think I have a really cute project for you. I used the Humming Along Bundle for my project along with a little ink blending and Stampin' blend coloring. Here's a look at my card. I used the Humming Along Bundle like I side before. Which is probably one of the most Spring filled bundle in the Occasions Catalog. It contains the Humming Along Cling Mount Stamp Set and the Hummingbird Framelit Dies at a 10% discount. 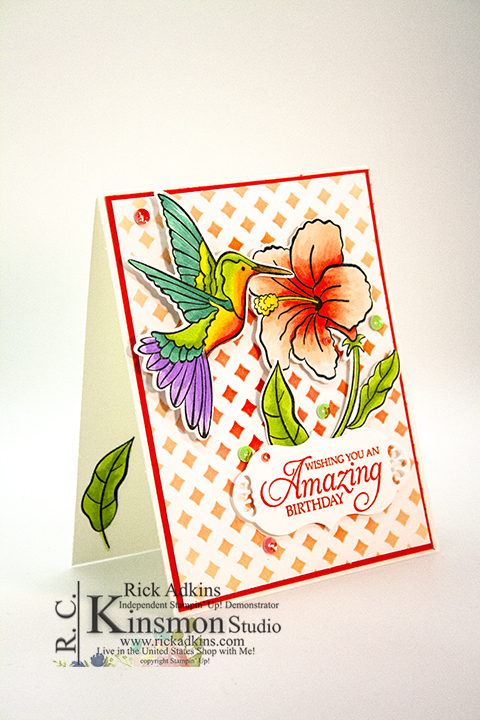 The Humming Along stamp set contains a pretty hummingbird stamp and a beautiful hibiscus stamp among a few others. The stamped images are designed so that you can use your favorite color media. Then when you pair that with the matching framelits you come up with the perfect combination. I started my card off my using one of the Pattern Party Decorative Masks and a little ink blending on a piece of whisper white cardstock (4 x 5 1/4). I picked the one that had the little diamonds in it because it looked like lattice work once I had the ink blending done. For the ink blending I used Calypso Coral and a little Pineapple Punch ink. Once I had the ink blending completed it was time to do a little stamping. I stamped the hummingbird, hibiscus, and a couple extra leaves in tuxedo black ink. I knew I was going to be doing a little stampin' blend coloring so I needed a alcohol friendly ink to do that. I started out the coloring with the hibiscus. For the flower I used Calypso Coral (light and dark) starting in the center working my way out in a flicking motion. Next I added just a little pumpkin pie light in the same manner. I worked out to the edges with petal pink combo pack flicking both light and dark colors into the center from the edge of the flower. I repeated this process for each petal. I colored the leaves and steam with pineapple punch and granny apple green. Next it was time to color the hummingbird. I used the following colors to do so; Granny Apple Green, Balmy Blue, Highland Heather, Pineapple Punch, Calypso Coral. I stamped the sentiment from the set on a piece of whisper white scrap and then used the matching framelits and cut out the sentiment. I added dimensionals behind the flower and added just a little multipurpose liquid glue on the stem. I added double dimensionals behind the hummingbird so that it was popped up a little more than the flower. I added the sentiment with a couple dimensionals. I hope that you have enjoyed my project for this month's blog hop. If you need any of the supplies that you have seen today you can pick them up in my online store 24/7. You will find a full list of the supplies that I used in the Stampin' Up! Shopping List below the Next Button. Next on the hop is Lori Willcox from the Canada; I know that she has done a fabulous project for you this month. Want to get all the Stampin' Blends that we offer but your own a budget? 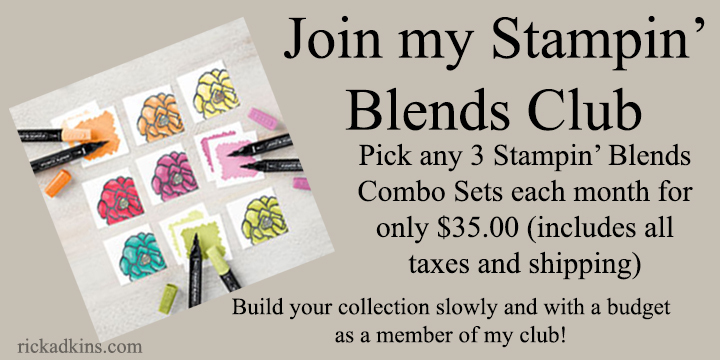 I can help with my Stampin' Blends Club! You can collect all the Stampin' Blends a little at a time. Email me to sign up or if you have questions! 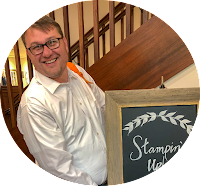 Labels: stampin' up!, crafts, cardmaking 2019 Stampin' Up! 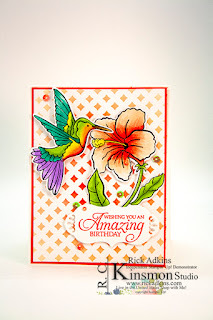 Occasions Catalog, Birthday Card, flowers, Humming Along Bundle, Hummingbird, ink blending, rick Adkins, Stampers Showcase Blog Hop, Stampin' Up! I'm so glad you used this set Rick. I struggle with this one for some reason. Your card is beautiful! Well done! Thanks tons for hopping along! Love this Rick! Your attention to detail is amazing! Love your vibrant colors. I also wanted to say I really like your blog header-just fabulous.